Dublin just begs you to throw down. The streets are choked with pubs, the whiskey is delicious, and the music scene is alive, kicking, and basically banging down your door. A couple of weeks ago, I went to a metal bar (hi, Gypsy Rose!) late one night and chatted up a bunch of locals, asking their favorite places to drink, eat, and have fun on the cheap. Among their answers: The parks in Dublin are beautiful, and while it's technically illegal to drink in them, if you're even remotely subtle about it, the cops here aren't trying to bust you. You’re in Dublin, after all. You've got to be raging prettttty hard to raise an eyebrow here. 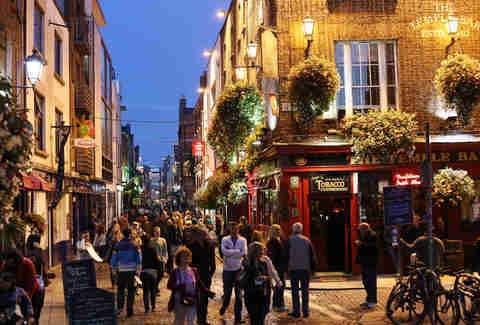 Just in case you needed more of an incentive than that, consider the fact that right now is one of the best times ever to go to Dublin: for the local scene, for the exchange rate, and for the chance to drink with the Irish. I mean, you can do that any time of year -- but here's why this summer is looking better than most. 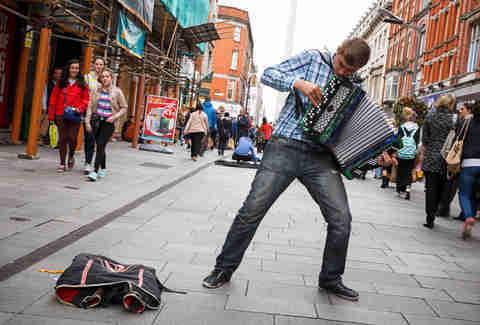 A flight to Dublin has been a relatively cheap way to hop across the pond for a while, but this spring and summer, airlines like Aer Lingus and WOW air have dropped their prices, including $400-range round-trip flights from the East Coast and even from LA. Pair that with the ability to get a $40 Ryanair flight out of Dublin to basically anywhere you want to go in Europe, and it's a great spot to jump off for an on-the-cheap European tour. Another reason to do it this summer and not hold off: The euro is also at one of the lowest points it's ever been… which isn't exactly something to celebrate, but definitely encourages travel, given that you're looking at about a 1:1 exchange rate. (Consider: Just three years ago, it would've cost you about $1.40 to match that single euro.) Prices in this story have been rounded gently into dollars, because that's how your brain will operate when you're there. Chances are high that if you're reading this, you're already a fan of Irish whiskey, and are also aware that Dublin, Ireland is the hometown of some of the best booze in the world. So when you visit, you kind of have to make a pilgrimage to the very source of your joy -- and get a bunch of whiskey for very, very cheap. 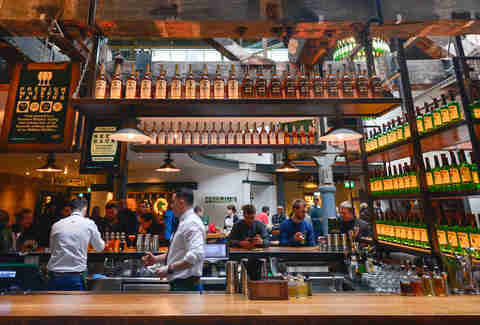 Check out the recently overhauled Jameson distillery’s Bow Street Experience: For 18 euros, you'll get a full tour and history of the distillery; a comparative tasting of Jameson, Johnny Walker Black, and Jack Daniel's, showcasing the differences among the different styles of whiskey; and a Jameson cocktail, served at the swanky bar. So to break it down, you get a tour, three shots of quality whisk(e)y, and a mixed drink, all in the name of education. That makes this spot the cheapest, and possibly coolest, way to pre-game for a night out in Ireland. If you're traveling solo or with a big crew, book your stay at one of the city's many hostels that come with free breakfast and Wi-Fi. One of the top options is the Isaacs Hostel; it comes with a sauna at your disposal, which officially makes it nicer than basically any other hostel I've ever heard of. Weeknight prices can get as low as $11 a night, but expect to pay up to $40 per on the weekends, or $80 euro for a private room. Hostel Barnacles is right in the thick of the action, and it also has dorm-style beds for around $20 a night. Jacobs Inn is great for mixing with other travelers -- it hosts a $12 pub crawl that comes with more drinks and shots than is probably advisable -- and dorm-style space will set you back as little as $15 a night. If you're traveling with a partner (or hope to pick up a local on your adventures), the best bet in Dublin is to book an Airbnb. An entire apartment in the city center may run no more than about $100 a night, and if all you need is a private room, you can get that for as little as $35. Look, a pint of plain won't break the bank at any of Dublin's amazing local pubs -- at a classic local spot like Grogan's, for instance, you should expect to pay around $5, plus $3.50 for a "toasty" to go with it (that's a grilled ham and cheese, made with local Irish Cheddar). 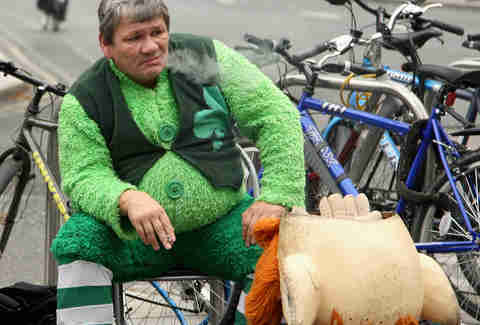 This is also the kind of place where you experience the joy that is drinking with the Irish. In bars stateside, randos who chat you up can come off as skeevy. 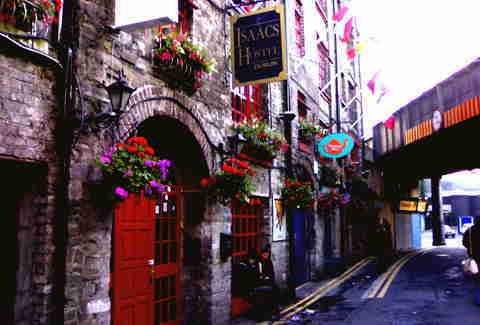 In Dublin, expect to be chatted up in a not-at-all-creepy way by basically anyone and everyone in the local pub. This is just a matter of how Irish pubs function: as the town's de facto living rooms. A couple of hours in, and you'll be swapping stories, buying rounds, snapping selfies, and tipsily pinkie-promising each other that you'll visit each other always. Not that I'm talking from personal experience. Some Dublin joints go above and beyond with the super, super-cheap drinks, snacks, and happy hour specials. Dicey's on Harcourt St rolls out a different special every night of the week, including $2 pints, wine, and bottles, as well as a late-night $2 burger special. Spring for the curry chips, too -- they're way better than they have any right to be. On Saturday nights, stop by the intimidatingly named Club Hell at O'Reilly's for a rock night that features some dirt-cheap drink specials, like $1 rail shots, $4 Jagerbombs, and $10 pitchers. Woolshed also has a pool table and some solid daily specials, including stuff like two-for-one burgers and pitchers full of cocktails for $15. If you're willing to expose yourself to the travesty that is pizza outside the United States, you should also stop by Cassidy's, where a pizza and a pint will set you back just $10. 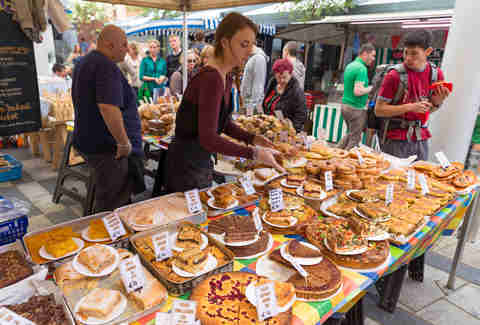 And for one of the best, simplest, cheapest meals of your life, go for the local meat pies, y'all. A steak and gravy pie will run you $4 at spots like Hanley's in Temple Bar, and sweet baby Jesus, are they delicious. Get invited to a local dinner party with Gruel Guerrilla. This is such an amazing time: Basically, you're invited into local home chef Kevin Powell's tiny apartment, where he feeds you an amazing meal of exclusively Irish-sourced ingredients, many of which have been foraged from city parks around Dublin. He's also really into traditionally Irish methods of preservation and preparation, so venture into his kitchen with him and chat him up about it -- I learned that you can preserve cowslips (which sound like something from a Tinkerbell movie, but are actually a kind of Irish flower) in sugar, and that they're delicious, and that you can harvest stuff like sea buckthorn just off the coast. It's $35 for seven courses, which has to be one of the better deals imaginable, and it's BYOB. Also check out Eatyard, which is a food market and event space open Thurs-Sun, featuring 10 food vendors that serve the likes of chicken cones (yup), burgers, and outstanding fish and chips. You can get a standard fish and chips pretty much anywhere in town, but for a more high-end experience that's still a good deal, check out Fish Shop, a fish and chip shop/wine bar. The menu is tiny -- like, three items -- the prices are good ($12.50 lunch, $14.50 dinner), and the wines are tightly curated and reasonably priced ($5.50 for a garnacha). 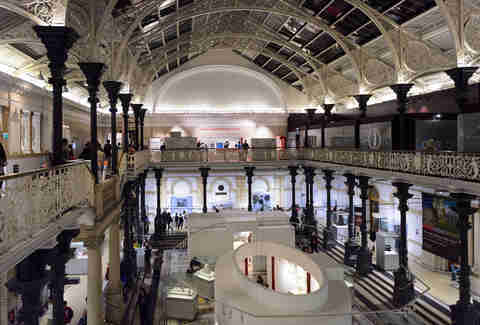 All of Dublin's national museums are free to visit, so check out some of the local archaeology or natural history (Ireland has plenty of both), as well as the Irish Museum of Modern Art, which has earned a reputation for showcasing provocative work from Irish and international contemporary artists. For $10, you can also take the "Dead Interesting" tour of Glasnevin cemetery, which provides an atypical, fascinating view of the city. For a quick $7 diversion, The Little Museum of Dublin will be a quick, fun hour that won't leave you feeling overwhelmed. Like every other visitor in Dublin, you'll undoubtedly want to snap a selfie in front of the famous Ha'penny Bridge, but the water is good for more than just an Insta backdrop. Book online for a $13.50 river boat tour, or spring for a $30, two-hour kayak tour down the River Liffey, right through the heart of Dublin. I'd also challenge you to walk half a block in the city center without encountering free live music, and lots of it. It comes pouring out of the pubs, from the street performers, and at festivals like July's City Spectacular or August's Beatyard (dress code this year: "nautical boogie"). Sadly, Jess Novak can't claim Irish heritage, but that doesn't stop her from knocking back Jameson like it's her job. Which sometimes it is. Follow her on Twitter @jesstothenovak and Instagram @jtothenovak.